The year 2008 marks the 60th Anniversary of the Universal Declaration of Human Rights. The Swiss Initiative aims to make a meaningful contribution, which takes the protection of human rights forward, rather than simply celebrating the drafting of this remarkable text. The Swiss Government decided to mark this event by initiating a process leading to the launching of an Agenda for Human Rights authored by a Panel of Eminent Persons. The Initiative is designed to achieve two objectives: first, to set out some contemporary challenges to the enjoyment of human rights as perceived by the Pinel, and second, to propose and support a research agenda with separate topics for selected research teams around the world. The project is sponsored and financed by the Federal Department of Foreign Affairs. The Ministry of Foreign Affairs of Norway and the Ministry of Foreign Affairs of Austria actively support the project. The Geneva Academy of International Humanitarian Law and Human Rights is responsible for the coordination and organisation of the Initiative. On 3 April 2008, the Geneva Academy of International Humanitarian Law and Human Rights invites experts in the field of human rights and international humanitarian law to meet in Geneva to share their views on the possible content of a future Agenda on Human Rights and offer advice on how to ensure the processes of agenda writing and implementation are effective as possible. The group was composed of about fifteen experts from universities, international organizations and courts, as well as civil socielty. The Swiss Foreign Minister selects a Panel of Eminent Persons. On June 11/12 2008, at its first meeting in Oslo, the Panel determines its vision for the project. The Panel selects 8 themes to be analyzed further and invites proposals from research teams and institutions to elaborate these topics. The Geneva Academy of International Humanitarian Law and Human Rights sends the selected research topics to universities and institutions and calls for short research proposals. The Panel selects the research proposals. 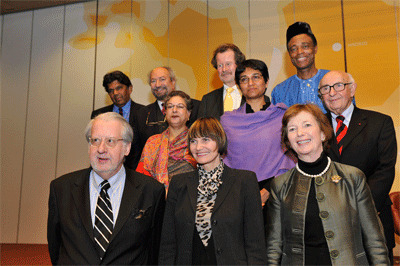 On 5 December 2008, the Panel and the researchers meet in Geneva at the invitation of the Swiss Foreign Minister. In this meeting the Agenda for Human Rights for the forthcoming decade is officially launched. From December 2008 onwards, Governments, international organisations and academic institutions are engaged in a dialogue on the Agenda. United Nations, New York, United States of America. Presentation of the Agenda by Rudolf Knoblauch and Mary Robinson. Wilton Park Conference, London, United Kingdom. Presentation of the Agenda by Rudolf Knoblauch, Paulo Sergio Pinheiro, Manfred Nowak and Andrew Clapham, followed by an open discussion. Organization of American States (OAS), Washington D.C., United States of America. Presentation of the Agenda by Paulo Sergio Pinheiro. Organization of American States (OAS), Washington D.C., United States of America. Meeting of the Committee on Juridical and Political Affairs of the Permanent Council, Presentation of the Agenda by Mary Robinson and Rudolf Knoblauch. Ditchley Park, Oxfordshire, United Kingdom. Human Rights Day Commemoration, Geneva, Switzerland. Update on the Swiss Initiative to Commemorate the 60th Anniversary of UNHR and presentation of Protecting Dignity: An Agenda for Human Rights by Rudolf Knoblauch. Annual Event, Sao Paolo, Brazil. The Panel on Human Dignity was created in 2008 to mark the 60th anniversary of the Universal Declaration of Human Rights. The Panel produced "Protecting Dignity: An Agenda for Human Rights" as a contribution to dialogue and joint action on prioritizing key human rights challenges for the second decade of the 21st century. Since the release of the initial Agenda in December 2008, the Panel has commissioned a number of research projects and pursued follow-up actions on a limited number of thematic issues. Its 2011 Report reflects on developments in the areas covered in the original Agenda and sets out ideas for future action by the international community. The Panel hosted an event to discuss the four thematic subjects addressed in its 2011 report: proposals for a World Court of Human Rights, the situation of people in detention, the links between climate change and human rights, and the need for scaled up actions to promote access to justice and legal empowerment of the poor.